Giving to Capital and Debt Retirement – $4,508,558 to bring our church debt to $0! …during the season of Lent, many of you spent time in prayer and self-examination as we emphasized the theme of “Compassion.” Over the course of those forty days, we reflected upon the love of God poured out for us and considered ways we could respond compassionately toward others – especially those in need. During that season of prayer and sacrificial living, we built our 47th house in cooperation with Habitat for Humanity, joined with hundreds of our fellow members in the 26th annual Great Day of Service, and generously gave $335,000 to our ministry partner agencies through our Lenten Offering. …during the fall, we focused upon the fruit of the Spirit as outlined in Paul’s letter to the church in Galatia. We remembered that good fruit is produced when the right seeds are planted in receptive soil and nurtured along the way. Together we discovered what it means to live a fruitful life. …finally, as we brought the year to a close, once again we committed ourselves to being “All In!” at Peachtree Road. Your generous support of Christmas Kindness – where folks in our community received warm winter coats, small appliances, a Bible, and a child’s toy, and the Christmas Eve offering to fund the purchase of water filters for folks living in the Kabazi region of Kenya were extraordinary! 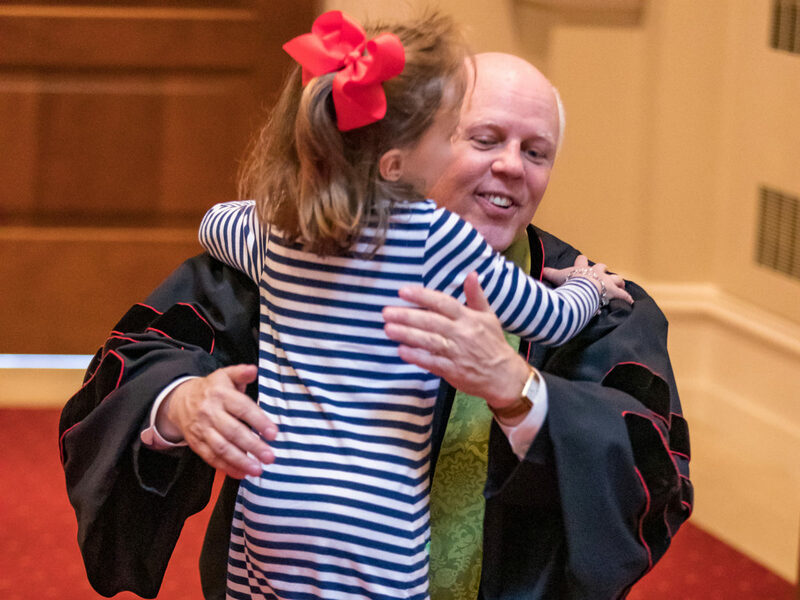 Now is the time for us to look forward, and Sunday promises to be a great day at Peachtree Road. This week marks the conclusion of our January series of messages entitled “The Fruitful Congregation.” We will be talking about “Extravagant Generosity.” Luke’s Gospel tells the story about a rich ruler who approached Jesus and inquired what he needed to do to inherit eternal life. After confessing that he was devoted to keeping the Ten Commandments, Jesus said, “There is still one thing lacking…” That one thing was a spirit of generosity. I look forward to exploring this spirit of generosity with you on Sunday. The Voices of Hope choir will be in concert this Sunday evening in our sanctuary at 5:00 pm. “Voices of Hope” is comprised of women from Metro State Prison and is under the direction of Chaplain Susan Bishop. Many of you have heard the beautiful music of this dedicated group when they worshiped with us a couple of years ago. I am inviting you to this concert at which you will not only hear their beautiful music, but a testimony of a life transformed by the grace of God. I am grateful for the women of our church who partner with Susan throughout the year to offer support and encouragement to these remarkable women. I look forward to seeing you at this concert. It is bittersweet to inform you that Nicole Marane, our associate director of music and associate organist, has tendered her resignation. After nearly 11 years, Nicole is leaving to take a position with another United Methodist Church in Atlanta as the director of music and organist. It has been a joy to work with Nicole, and it is with sadness that we bid her farewell. However, she is ready for this new opportunity, and we congratulate her and wish her well. Her last Sunday with us is February 10, and we will have an opportunity to express our gratitude for her ministry in our midst at that time. I would like to take this opportunity to invite you to join Wendie and me at a fun event on Friday, February 8. Peachtree Road’s global outreach ministry team is sponsoring an art auction to benefit our partners in ministry in Nicaragua — Pineapples of Peace. With the civil unrest in the country, they are struggling to do their work and need our help. The event will be held from 7:00 pm until 10:00 pm at Trackside in Chamblee and will feature both silent and live auctions for one of a kind pieces of art as well as delicious food and fellowship with your fellow church members. To register please use the following link: www.prumc.org. If you or someone you know is struggling because of the government shutdown, please contact the church office. We will help find the resources needed during these days. Finally, on Sunday morning, we will install members of the 2019 Administrative Board. This is the decision-making body of our church, and this year’s chairperson is Palmer Proctor. At the close of the worship services on Sunday, I will invite members of the Board to come to the altar rail, and we will offer a blessing upon them as they begin a new year leading our church. Their first meeting is set for Monday evening. I am grateful for your wonderful support in so many ways. Please call on me if I can be of help to you in any way. See you at church Sunday!